South Carolina's House Bill 3826, which would, if enacted, have allowed public school districts to offer elective courses on religion — and to "require the teaching of various theories concerning the origin of life, including creation science[,] as part of the course content" — died in the House Committee on Education and Public Works on April 10, 2019, when a deadline for bills to pass their house of origin expired. The attempt seeking to require the teaching of climate change in Connecticut's public schools by law continues, despite the death of the original bill proposing the requirement. And in the meantime, the two bills attacking the treatment of climate change in Connecticut's state science standards are dead. The Alaska state board of education unanimously approved a draft of new state science standards on March 29, 2019, according to KTOO Public Media in Juneau (March 29, 2019) — and climate change is included. 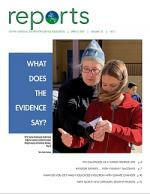 NCSE is pleased to announce that the latest issue of Reports of the National Center for Science Education — volume 39, number 2 — is now available online. NCSE is seeking to hire a second part-time summer intern to assist our teacher support and community outreach programs. Climate change and evolution were the primary targets of complaint from "nearly every person who grabbed the microphone" at a March 26, 2019, hearing in Salt Lake City, Utah, about a proposed set of high-school-level state science standards (PDF), according to the Salt Lake Tribune (March 27, 2019), even though the standards' treatment of those topics is scientifically accurate and pedagogically appropriate. At a time when climate change education is under legislative assault in Florida, a new poll from the Saint Leo University Polling Institute shows strong support in the Sunshine State for teaching climate change in the state's public schools. NCSE is seeking to hire a part-time summer intern to assist with the national expansion of NCSE's science outreach program. "State lawmakers from Connecticut to Florida are proposing measures that some groups say could threaten how science and climate change are taught in the classroom. More than a dozen such bills have popped up this year, including from state lawmakers pushing back against broad scientific consensus that people are warming the planet, according to the National Center for Science Education," reported the Washington Post (March 11, 2019). Two bills targeting the Iowa state science standards partly because of their treatment of climate change died on March 8, 2019, when the deadline for bills to be reported out of committee expired. Iowa adopted the Next Generation Science Standards in 2015.